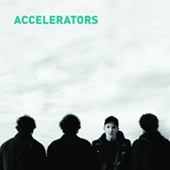 Punk rock boys and girls behold, the Accelerators' self titled debut album! These Rotterdudes have teamed up with the friendly folks at Stardumb and Squinty Joe Records to let that Rotterdam Punk Rock City #1 sound reign once more. Here's 12 tracks of pure scorching and blistering sonic pop punk rock bliss on both 12' vinyl and CD. The Accelerators blast out their songs and Kepi (Groovie Ghoulies) and Dan Vapid (Screeching Weasel, Methadones) sing along!